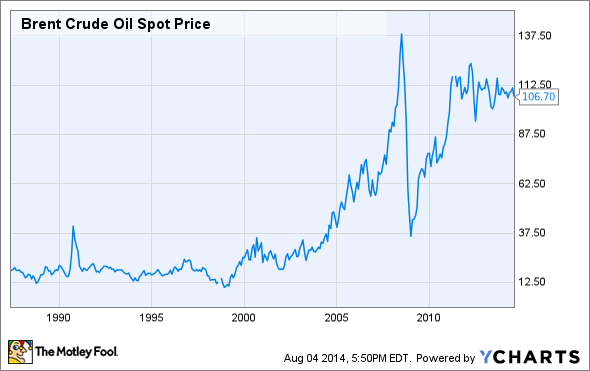 Is the Peak Oil Myth Dead? Many people are concerned that the world is fast approaching peak oil, a point at which oil production will hit a top and begin an inexorable decline that could herald global recession or even a collapse of civilization. This article explains why such fears can be forever laid to rest. In his 2005 New York Times best-selling book Twilight in the Desert: The Coming Saudi Oil Shock and the World Economy, renowned oil analyst Matthew Simmons outlined his belief that Saudi Arabia's giant Ghawar oil field would soon begin a terminal decline that would result in permanently falling global oil production. Indeed, from the post-recession lows of 2003 until peaking in 2008, oil prices seemed to prove peak oil proponents correct -- with prices seemingly on a long-term exponential increase. However, what Mr. Simmons and other peak oil theorists failed to consider is that America's shale oil revolution could not only make up for Ghawar's production fall, but even replace the field entirely. According to Pioneer Natural Resources, the Permian Basin of West Texas and New Mexico holds an estimated 75 billion barrels of recoverable oil, an estimate that is up 50% in just the last year. Compare this to Ghawar's roughly 70 billion barrels of remaining oil and then factor in that the Energy Information Administration (EIA) estimates the US's technically recoverable shale oil and gas deposits stand at 223 billion barrels, and one can see there is little cause for alarm. In fact, according to bank of America, in the first quarter of 2014 the US became the largest producer of fossil fuel liquids in the world, a fact verified by the International Energy Agency in June. That impressive feat was accomplished thanks to the incredible growth of oil production from Texas and North Dakota, which increased their production by 117% and 177% respectively between 2010 and 2013. However, as impressive as America's explosive oil growth has been and as large as our resources might be, they don't hold a candle to the immense untapped potential that exists around the world. Russia's Bazhenov shale formation is the size of California and Texas combined and is estimated to also hold 75 billion barrels of oil recoverable with current technology. To put that in perspective, 75 billion barrels is about 10 times the estimated recoverable resources of North Dakota's Bakken formation, which has increased its production 20-fold in the last six years. The EIA estimates that the Bazhenov ultimately holds 1.2 trillion barrels of oil in total. To fathom just how much 1.2 trillion barrels of oil is, consider this: According to London's Oil Depletion Analysis Center the world has thus far, in its entire history, produced 1.2 trillion barrels of oil. Interestingly enough, according to the EIA, the world's traditional (non-shale) oil resources currently stand at around 1.3 trillion barrels as well. Russia's Bazhenov formation may be mindbogglingly huge, however it represents just a fraction of total global shale oil resources, which the EIA estimates to stand at 3.357 trillion barrels. And Canada's fabled tar sands alone could hold nearly as much oil as that -- 2.5 trillion barrels at the high end of estimates. However, the single largest potential mother lode of oil is Colorado and Wyoming's Green River Formation, which the US Government Accountability Office believes to hold as much as 3 trillion barrels of oil. Unfortunately, these resources come in the form of kerogen, which is trapped inside rock that must be intensely heated to extract. It's estimated that, of this bounty, only 1.8 trillion barrels could ever be technically recoverable due to the intense energy and water resources required. For example, to extract 1 million barrels/day would take enough power for 9 million homes and enough water to supply all of New York City for 45 days. Nonetheless, the world's remaining oil resources all told stand at 7 trillion to 10 trillion barrels, six to eight times what humanity has thus far pumped out of the ground. At today's production levels it would take 220 to 300 years to deplete all that oil (assuming our resource estimates don't rise over time, as they've been doing for decades). Before we all take to the streets to celebrate the end of the energy crisis, there are several important factors to consider. First of all, recent US sanctions against Russia over its actions in Ukraine have resulted in a denial of key economic resources, including deepwater offshore drilling rigs and fracking equipment. This could hinder exploitation of the Bazhenov formation, at least in the short term, because Russia is increasingly dependent on Western technology to increase oil production from hard-to-drill locations. Second, much of these resources will never be economically recoverable simply because the amount of energy it would take to extract that oil would be more than is contained in the oil itself. In addition, though much of the oil could prove recoverable, it would require prices so high the world will have moved to alternative energy sources by then. Peak oil is inevitable in the sense that one day the world will find better alternatives to oil and voluntarily choose to stop using it as much. However, perpetrators of the supply side peak oil myth fail to take into consideration the innovative spirit of thousands of engineers, scientists, and industrialists who are constantly looking for solutions to our energy needs. In other words, it's not inconceivable that your grandchildren might be driving gas-powered cars even 100 years from now.